Wow I have managed to resurface from the depths of summer holidays. We rocked the South Coast of New South Wales (along with 90% of the state) for Christmas. We completely blobbed out on the beach Christmas morning and cooked some delicious Chrissy meals, seafood of course. My triumph of the season was the moist and tender huge fillet of salmon I cooked up whole with a divine marinade of lemon, dill, garlic & mustard. Nothing goes down better after a hot day than a Vietnamese inspired noodle salad. 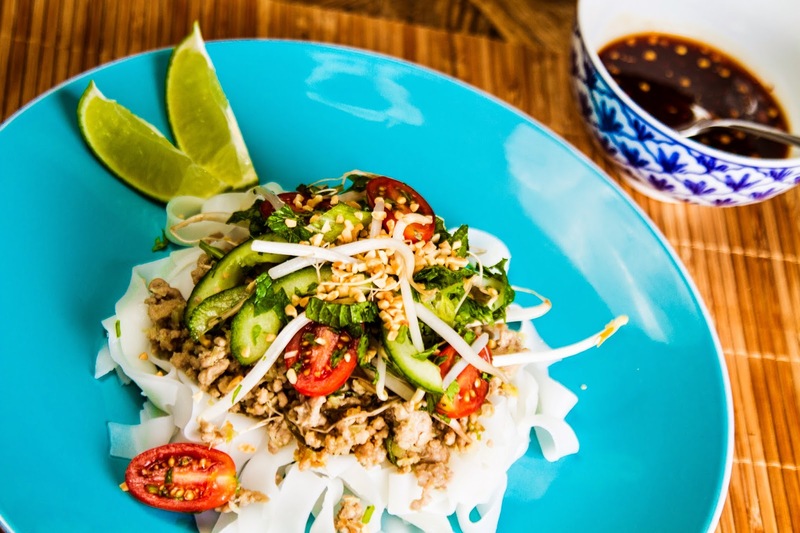 It's fresh herbs and tangy dressing will have you longing for a trip to Vietnam where the food is only out shone by the wonderful smiles of the locals cooking it. I whipped this one up one evening and enjoyed it so much I thought I better share it with you. Add 2 tbs of oil to a pan and on a medium heat brown the pork mince. Whilst this is browning add the ingredients listed under "pork paste" above to a mortar one by one in order of how they appear and pound each till you form a paste. Add paste to the pan with the browned pork. Fry for 5 minutes stirring paste through mince well. Add to the pan the ingredients listed under the "pork" heading above. Simmer on a medium heat till all liquid evaporates. Approx 15 minutes. Whilst the mince cooks assemble all of the ingredients listed under "salad" in a salad bowl. Reserve the bean sprouts and peanuts as these will be added last. Combine all dressing ingredients, mix well and set aside. Once pork is ready, serve your salad onto your serving plates. Top with a helping of the pork, pour over your dressing to taste and garnish with bean sprouts and peanuts that you reserved from the salad ingredients.